On this page you will find a selection of my work – please come back every so often and have a look as I will be adding to / changing the selection over time. By clicking on the images, you will see a larger version. More works may be seen on my website. 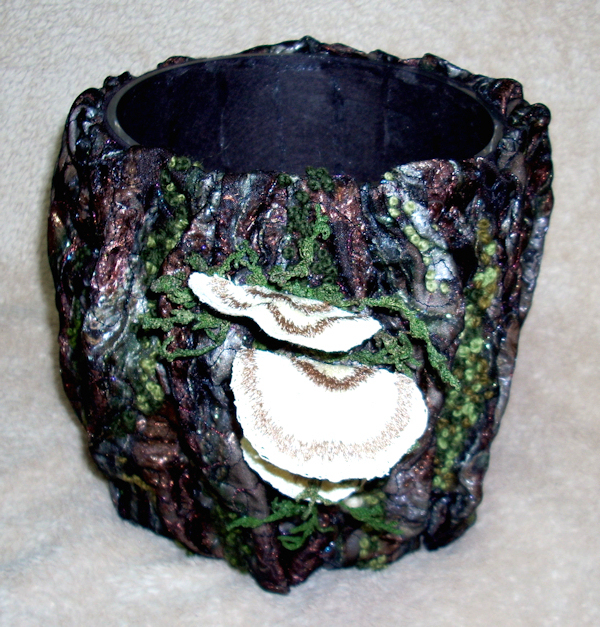 This is a vase/pot holder that I constructed as a gift for the opening guest of our Embroiderers Guild’s annual exhibition. There are three views shown. Inside is a glass container which means, yes you can use this as a vase, or as a pot holder (it looked really cool when I placed a potted fern in it!). The glass insert is glued securely to the fabric outer. 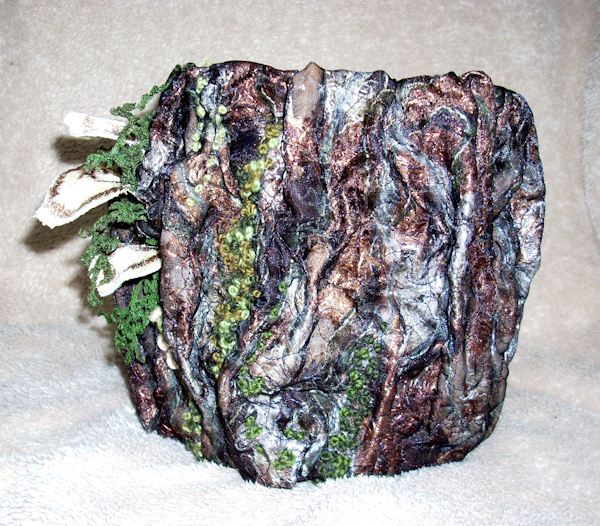 As with any trunk or branch in the bush, the moss appears only on one side of this piece. The moss is a combination of many French knots, and of free motion embroidered long moss strands. 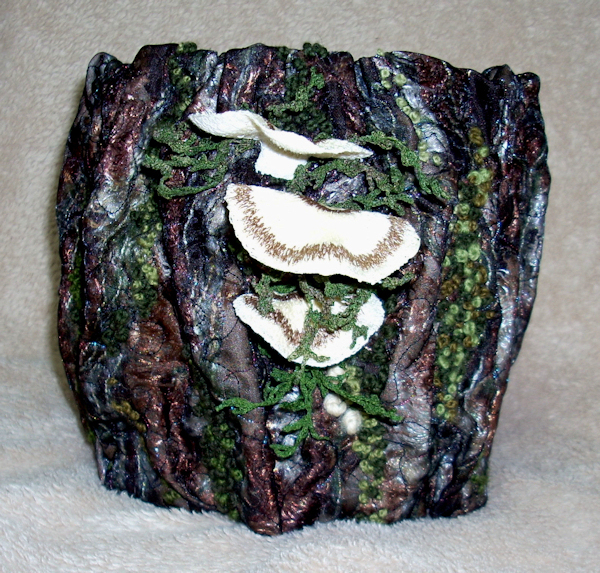 The large fungi are made solely from stitched threads, and the young buds of fungi are French knots done with many strands of thread in the needle. 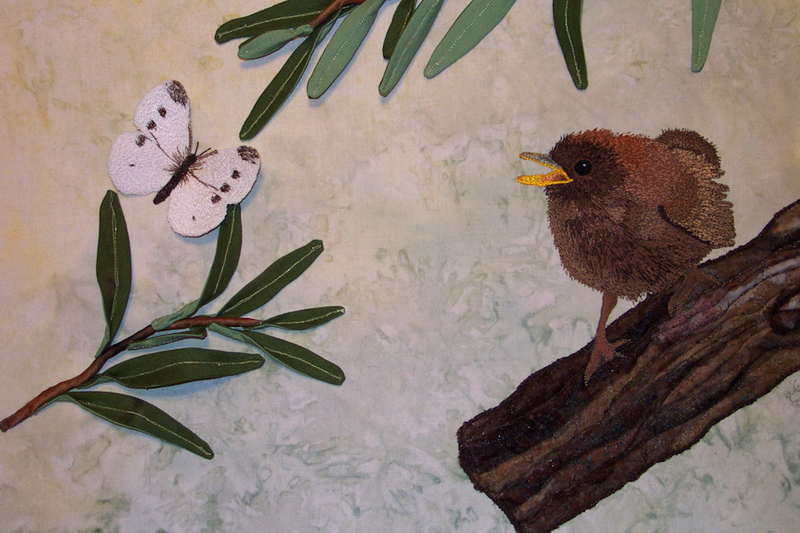 This lovely baby wren is wishing that the butterfly would come just that little bit closer. Picture here is of the work prior to framing. Please visit my post of 31st December 2010 for more information and pictures. 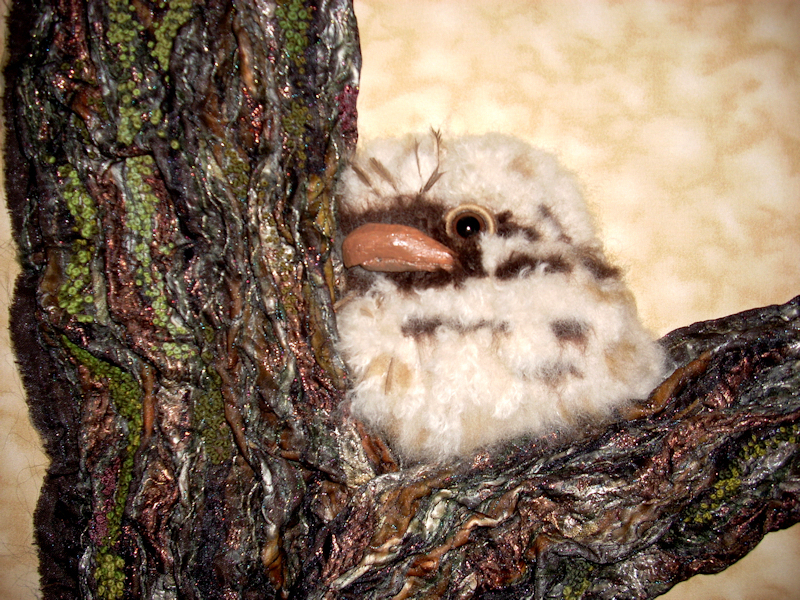 This is a young Tawny Frogmouth staying very still in the fork of a tree, waiting for mum to come back. The photo is before I had it framed up. Techniques used include: layering, sculpting, hand embroidery, machine embroidery, painting. 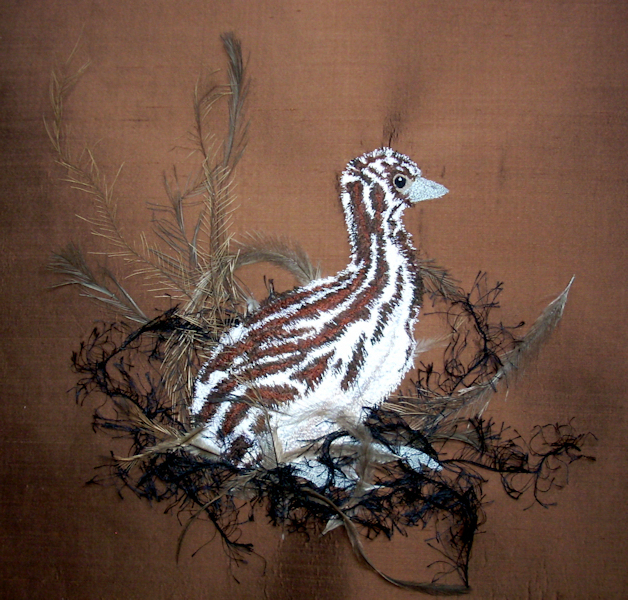 The baby emu was painted onto silk prior to thread painting by machine, padding slightly, and stitching to the background (which had already had some fibres and real emu feathers on it). 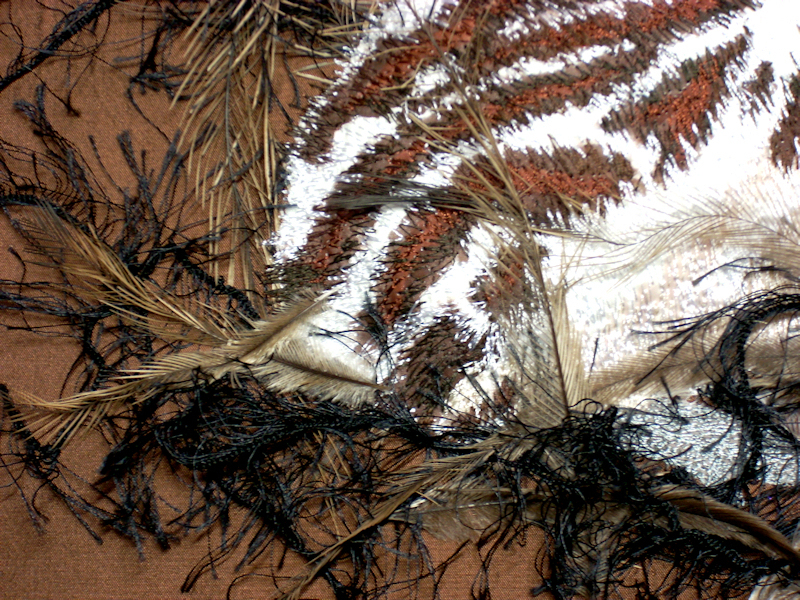 Further feathers and fibres were then added. When the completed work was framed (under glass) some of the nesting material was draped over the mounting board. Below is a close-up. The Mayfly was fun to do. Its wings (all four of them) are wired so that there is a dimensionality to them. The branch is slightly padded. The sun/sky is layered silk and wool tops. Using the silk added a lovely sheen to the sun. The mountain range is layers of chopped fabric under a sheer fabric. 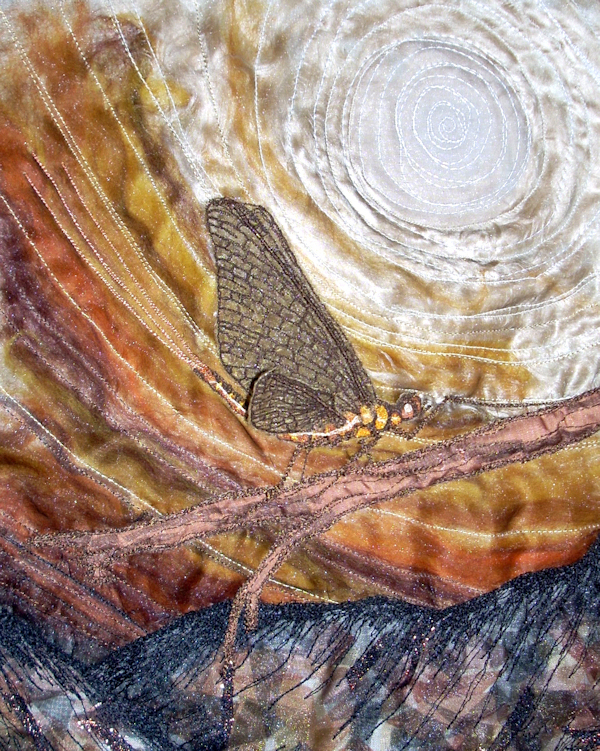 I like your work and love sharing all things textile, especially mixed media, needlefelting and 3D work. Very cool!! Waiting for Mum is so lifelike. I love your treatment of the tree trunk. Thank you Claire – I loved creating it. It was good to combine hand embroidery with machine embroidery. The tree trunk is made with layers of fabric, fibres and threads which have been machine embroidered together and then drawn up into the 3D shape. Heaps of French Knots were then added in many shades of green tapestry wool to depict the moss on the trunk. This piece was on exhibition at The Embroiderers Guild, Victoria’s wool embroidery exhibition a few years ago, where it sold… it’s sad at times to see my work go to another home, but nice at the same time! Have you had the opportunity to drop by The Embroiderers Guild, Victoria? There’s always something on display there.